Hillary B. Smith on Her Whirlwind Return to Daytime and More! Hillary B. Smith and Genie Francis on the “General Hospital” set. Photo by XJ Johnson/JPI. It’s only been a few days since “General Hospital” announced that Hillary B. Smith (Nora Buchanan) would be joining the show. Smith had some enlightening things to say on her Port Charles arrival. Smith revealed that as soon as the lawsuit between ABC and Prospect Park settled, Smith received a call from Frank Valentini, asking her to come to “General Hospital” (GH) for a spell. “But when the decision was made and a judicial answer came forth [in December], it was pretty much the next day that I got the call from [GH executive producer/former OLTL boss] Frank [Valentini]—and it was very surprising. I did not expect it at all,” Smith told tvline.com in an exclusive interview. She had one condition for Valentini: it had to be fun. The GH Executive Producer assured her it would be. “You’re going to enjoy these people,” Valentini told Smith. OMG! It’s Like Totally Laura Spencer! 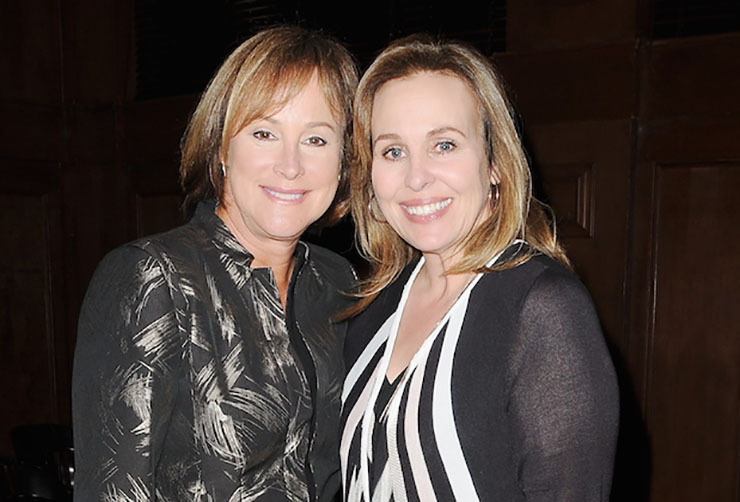 Hillary B. Smith’s inner fangurl came out when she got to meet and work with, Genie Francis (Laura Spencer). “I guess the fan in me is still there, which gets all giggly and stuff when I see people I have watched for years,” Smith said of meeting an icon even after all her years in the industry. “What’s really fun was seeing all these old buddies that I hadn’t seen,” Smith said of the many familiar faces she encountered on the GH set. The first ex-“One Life to Live” cast mate Smith saw was Roger Howarth (Franco Baldwin), then Michael Easton (Dr. Finn Hamilton). She was also glad to see old friends Nancy Lee Grahn (Alexis Davis) and Michelle Stafford (Nina Cassadine). The video announcing Smith’s Port Charles debut, indicated that she’d be involved in some intense legal wrangling. See the video below. When asked about storyline specifics ahead for Nora, Smith was tight-lipped. When asked what Nora’s been up to all this time off-screen, Smith was more forthcoming. “I think she’s kind of been living happily ever after, with Bo. Doing her legal thing and loving on her husband, seeing her kids. I’m wondering whether she has more grandchildren about now…? I don’t think so,” Smith said. Previous ArticleThe Young and the Restless Spoilers: Who Said Corporate Life Was Boring? Very disappointed the role of Nora Buchannan was so short-lived on GH. I love the energy Hilary brings to to Nora’s character. GH could really use it. She was great in court up against Diane Miller in defending Valentin. With all that goes on in Port Charles, I wish the writers would get the sense to carve a permanent role for her. Agreed, Max. Here’s hoping Nora and others will come to stay permanently in Port Charles!